Photo courtesy of Jar With Most. Photo courtesy of The DerbyTech Track Guide. How come I've never seen this track before?? I know you've probably driven by it on the highway behind southwestern, Sarah, but there's not much to see. I rode my bike over there once as a kid. It was less than two generations ago that kids thought that a gravity powered Soapbox car was exciting technology, and parents thought that building and competing in a Soapbox car would teach their kid useful mechanical skills. Maybe today's equivalent is First Robotics. Quite a change. The Soap Box Derby is one more casualty of our high-tech world. Just like electronics nerds used to build vacuum tube Heath Kit radios (I still have mine in the basement), the mechanical kids built derby cars. We had a Civic Park boy win the derby in the mid-fifties. He was a neighborhood celebrity for this feat. The cars had a fair amount of sophistication in them; balanced wheels and axles with high tech lubrication for starters. Jumping forward 40 years, I was blown away the first time I attended a First Robotics event. Cheerleaders firing up the crowd and a gymnasium full of techno-nerds having the time of their lives. One robot actually went after its opponent, hammered it to death and then took its sweet time completing the assigned task. I believe they plugged that loophole the following year. Each team has several groups; electrical, software, mechanical, finance, advertizing/marketing, etc. There is a place for everyone on a First Robotics team. Anyone watching these kids at a competition can't help but be impressed. Hmmm. Try again. Intertoobz ate my reply. The contractor also donated their fees for excavation, materials, and pouring of the asphalt. I believe it was Flint Road Builders (Bob Bammert). There's something about that "runway" that reminds me of Meig's Field in Chicago before Mayor Daley had it bulldozed in the middle of the night like a third world dictator would have done. No Lake Michigan though. As a JV baseball player at SWA our coach had us run all the way to the bottom and back while holding the back of the pants (like in the belt area) of the player in front of us. It is way longer than it looks. Flint Young Life had a bike festival every year and that track was the site of the big final races. One year a boy was peddling down that hill in the final heat, flipped over and lifted his hand up with a finger bone poking out. My sister was a candy striper at St. Joe's Hospital so she told everyone to stand back while she administered first aid. I was six years old and thought she was so grown up. 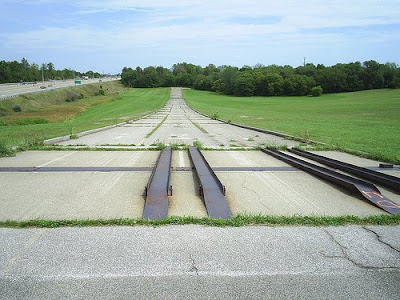 My memories of the Soap Box Derby were when the track was on Cadillac street. We lived a block away on Cottage Grove. In the two or three days prior to the race, they would construct a wooden ramp to start the cars. Fascinating to watch this go up. They would also erect a large tent in the field behind Durant-Tuuri-Mott to house the cars. These were exciting times for a 10 year old. 9/9/2013 Hello to the Person who wrote the paragraph telling about the Soap Box Durby being held on Cadillac street in Flint, Michigan and living a block away on Cottage Lane. 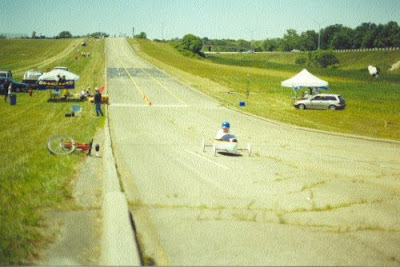 I raced with my Soap Box Derby Racer on Cadillac street in Flint in the Soap Box Durby in 1954 when I was 14 years old and set the fastest speed of that day at 28.3 mph. I remember many things about that day I would like to share with you. Please sent me an E-Mail.